In 2012 I posted a series of essay tracking an unusual incident that occurred in LeRoy NY, where a number of teenage girls (and one boy) suddenly began twitching and shaking and involuntarily emitting other body movements for weeks, to the point where their sports an schooling were impacted. It sounded to me like a supernatural event, though many scientists and civic luminaries, even the famed environmental lawyer Erin Brockovich, attempted to narrow down the cause to a secular or scientific reason. They couldn’t. In that essay series, I’d mentioned a similar historical incident and that was the Salem Witch Trials, where the ‘symptoms’ were similar. In posting this Throwback, I’m including a new-to-me piece of information that a friend sent. The Dancing Plague of 1518 is strikingly similar to the above two, the LeRoy NY and Salem incidents. In 1518 Strasbourg, a women suddenly began shaking and dancing in the main street and never stopped. She kept it up for a week. Others began the same, some dancing until they dropped of sheer exhaustion or even died of heart attack or physical stress. The dancing was involuntary. Up to 400 people were affected and there were many deaths. It is more common than one would think. There are other historic and well-documented mass psychogenic illnesses, including a mass laughing hysteria in Tanzania then continued for 18 months, for example, among many others. We tend to dismiss such incidents in today’s world, being modern and all that. But when we see sustained, documented cases for which there has been sought a scientific, medical, of civic reason to no avail, it would do well to remember that the evil supernatural is alive and well in the world. Though many origins and causes were proposed, the resulting diagnosis was the same as all the other incidents, mass psychogenic illness. When you see a diagnosis of mass psychogenic illness, the Christian could well be thinking “mass demonic possession”. Don’t dismiss the supernatural possibility. Though we don’t want to become ensnared in an unholy obsession, we do want to be realistic about what the Bible says about demonic activity. Be sober-minded; be watchful. Your adversary the devil prowls around like a roaring lion, seeking someone to devour. (1 Peter 5:8). On January of this year, I posted an essay which reported that students at a western NY high school in LeRoy NY had come down with…something. At that time, doctors, school officials, and parents were not sure what they were dealing with. A bunch of girls who attend the school suddenly started showing symptoms of Tourette’s Syndrome. They began twitching, having tics, involuntary movements, and for some, their schooling was impacted. They had to drop out of sports teams or drop out of school entirely. Then a teacher at the school came down with it, and several other people, including a couple of boys. At that point it made national news. The school had conducted tests to determine if their location was a cause. The famed environmental lawyer Erin Brokovich came on the scene to determine if there was an environmental cause. Doctors were consulted. Everyone came up with empty hands. One doctor dared to state that it was probably a condition known as “mass hysteria” but that diagnosis was resisted. They decided to simply call it Tourette’s. At that point I got interested. Mass Hysteria is a real diagnosis, and is one that is at root of another famed incident: the Salem Witch Trials. Here are the two previous essays I posted on the Leroy NY mass hysteria incident. This is very interesting to me because as I mentioned in the two essays I linked to above, the Salem Witch Trials in the late 1600s began in exactly this same way. Several teenage girls began manifesting symptoms remarkably like the girls in NY, and like wildfire, the ‘disease’ spread from house to house. The reasons for the hangings that resulted has multiple and complex reasons- cultural, religious, demonic, and societal. There was a feud going on between the merchants and the farmers. A growing town always fights over its direction (to develop or not to develop?) when they hit an important crossroads in its identity. The girls admitted to experimenting with voodoo with Tituba, their South American Indian maid who had been a slave in Barbados. 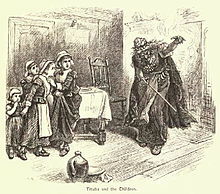 Tituba had also made a witchcake containing dog urine and rye, which is fed to a dog in hopes of determining the person afflicting the sick. Boredom, pride, and covetousness, and gossip can equally be said to blame for the Salem incident’s catalyst. And satan is behind all of those, not to mention the localized practices of voodoo, casting bones, and fortune telling some of the girls and Tituba admitted to! Any time there is unexplained mass illness it needs to be looked at carefully by the officials whose duty it is to serve and protect the vulnerable in our society. However in this day and age, demonic influence is rarely discussed as a possible root cause of the problem. It was all right for the “backward Puritcanical Bible thumpers” to blame satan, but not today. The same could well be true of the Leroy Mass Hysteria incident. There is one question I am sure was not asked amid the tests and diagnoses and reports that resulted in 6000 pages which concluded “We don’t know why this is happening”. Were the girls experimenting with tarot, palm reading, fortune telling or occult in any way? The answer would be very revealing. Please be in continued prayer for the Leroy NY girls and also for the vulnerable of our society everywhere. I long for the day when our children will be safe. The American Family Physician Magazine: What Is Mass Psychogenic Illness?